The amount of space available on an SD card is much more limited than the amount of space on a hard disk, so it's worth attaching a hard disk to your Pi. The simplest to expand your Pi's storage capacity is with a USB hard disk. If you're planning on leaving the same USB hard disk connected to your Raspberry Pi all the time, then you need to make sure that your Pi mounts the drive automatically every time it boots. You can do this by editing the file system table file. My USB disk is listed in /dev/sda1, and the file system type is Fat32. If your USB drive has an NTFS 3g file system, you will need to install an NTFS driver. In order to access the files and folders on a disk, Linux needs to mount it. The contents of the disk will appear as a folder in /media. You can mount disks in other folders, but it's conventional to use /media. You need to create a directory where the mounted disk will appear in the media directory, and change its owner to pi (or any other user account that you might have created). Add the following line, and save the file. Reboot your Pi to and you should be able to access your USB drive via /media/usbhdd. Computers have hostnames so that they can be addressed by a human readable name as well as by their IP address. The default hostname for your Raspberry Pi is raspberrypi. The name of the workgroup can be anything you want, as long as it only contains alphabetical characters, and it matches the name of the workgroup that you want to join. Scroll down smb.conf until you see a section called Share Definitions, and add this code there. The path should point to the drive or folder that you want to share. I've set 'only guest' and 'public' to 'no' so that Samba prompts for a password when I visit the folder that I've shared. This means that when I'm using a Windows PC, I can login to the shared folders on my Pi, and I'll have the same read/write permissions that user pi has. If you have a PC or laptop connected to your workgroup, you should be able to see your Raspberry Pi in Windows Explorer under Network. Being able to back up data to the cloud is very useful. It means that even if your Raspberry Pi dies or your SD card gets corrupted, your data is still safe. It also means that you can access your data from any where in the world. If you have a Google drive account, you can use the grive program to sync a folder on your Pi with your Google drive. You need to create a directory where you can store files that you want to be syncronized with your Google drive, and copy the grive executable to that directory. The first time you execute grive, you need to use the -a option in order to authenticate with Google. You must be logged into your Google account from your Pi for this to work. If you're logged into your Google account on a PC or laptop, log out, and then log in again using a browser on your Pi. Once you've done this, change to your Google drive directory and run grive. A link will be printed in the terminal window. Copy the link and paste it in a browser. A page on google.com will appear with a long code that you need to enter in the terminal window. Pasting the code didn't work for me, so you may have to type it in. The authentication process will then take place, and your Pi will sync for the first time. Before you do this, check to see how much space you've used up on your Google drive, and check to see if there's enough space on your Pi's SD card. If you've got this far, you should now be able to sync files and folders in /home/pi/google_drive with your Google drive. The next step is to backup the data on your Pi and upload it to your Google drive. The following bash script creates a tar archive containing my home directory. I've made sure not to include the Google drive directory in this archive, otherwise previous archives would be included in the backup. The second line compresses the archive into a .tar.gz file. The file is moved to the google drive directory before running grive to upload the new archive to your Google drive on the internet. I've used the date command to embed the current date in the file name. tar -crvf backup_$(date +%y.%m.%d).tar /home/pi --exclude="/home/pi/google_drive"
Save this code as grive_backup.sh, and make it executable using the chmod +x command. When you run the script, it may appear to hang while gzip is running. This may take a few minutes depending on how much data there is in your home directory. This specifies that you want to run grive_backup.sh at 3.00am every day, and it should be run as user pi. Linux should automatically detect that your crontab file has been modified, so there's no need to reboot. This time the date command is being used to create a date from 7 days ago, so a back up file from 7 days ago will be deleted. 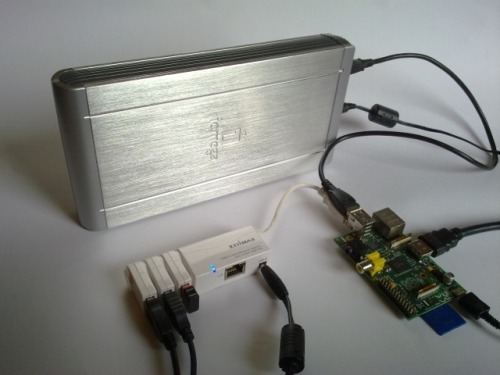 Many people are using their Raspberry Pi as a home web server. It's a great way to host a small site without having to leave a PC running 24/7. If you want people to see your Raspberry Pi web site on the internet, you need to forward a domain name to your home IP address, and then forward a port on your router to your Pi. In this article I'm going to assume that you've already set up a web site and you need to just need to make it accessible on the web. The diagram on the right shows a typical network set up for a Raspberry Pi. The Pi is connected to a router by wifi or ethernet. I use ethernet for my server as it's more stable. The router has an external IP address which it uses to communicate with the internet, and it has another IP address which it uses to communicate with your home network. Let's say the router's external IP address is 88.23.65.123. The router's internal address acts as a gateway for all the devices on your network. 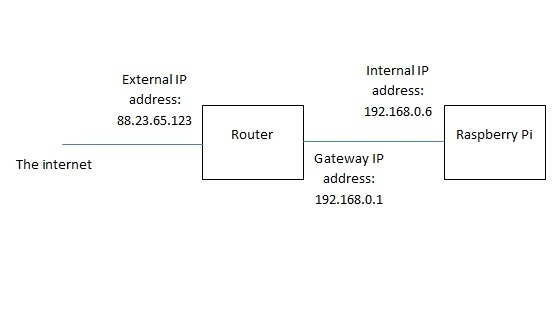 When your PC requests data from the internet, requests are automatically sent to the gateway address, and the router forwards the request to the internet. The gateway address is usually something like 192.168.0.1. Most home routers have a firewall built-in. This stops people from outside of your home network connecting to your PC, but it allows your PC to make outgoing connections to web servers. The external IP address of your home router is usually assigned by your ISP's DHCP servers. If you need to restart your router, it will make a new DHCP request to your ISP, and it may be given a new IP address. How are web requests processed? When a user visits a web site, they use the site's domain name to address the site. Their browser then sends a request to a DNS server to translate the domain name into an IP address. Once the browser has the site's IP address, it sends a request to the server. 2. your Pi is behind a firewall and can't be accessed directly from the internet. The first problem can be solved by using a dynamic DNS service. These services act as DNS servers that update automactically if your IP address changes. There are numerous dynamic DNS services available. Most of them provide a free service where you can choose a subdomain name. You need to install a small piece of software on your Pi. This software is supplied by your dynamic DNS provider, and it monitors the external address of your router. If that address changes, the software sends a message to the dynamic DNS server to update its records. A dynamic DNS system specifically for Raspberry Pi servers is due to be launched in October/November 2013. You can read more about this at rpidns.co.uk. When a user on the internet wants to see your web site, their browser can get the IP address of your home network from your dynamic DNS service. But requests still need to find a way through your router's firewall. By default web servers listen for connections on port 80. When a user's request to see a page on your site reaches your router, the router must forward that request to your Pi's IP address. You don't want to forward all incoming traffic to your Pi, just the traffic for the web server which is on port 80. Most routers allow you to set up port forwarding so that any traffic on port 80 will be sent to your Pi. Instructions on how to do this vary from one router to the next, but you can find some pointers at wikiHow.com. In most routers there are options to use an existing forwarding rule for HTTP traffic on port 80. If the rule doesn't already exist, you'll need to create one. If you are prompted to choose between TCP and UDP, pick TCP. You'll need to specify your Pi's IP address, so you need to give your Pi a static IP address. Note that some ISPs block port 80 to prevent their customers from running web servers (to reduce bandwidth usage). In this case, you need to configure your server to listen on a different port, say port 87. You would need to set up your router to forward traffic on port 87, and you would need to configure your dynamic DNS service to forward requests on port 80 to port 87. You may need to restart your router for changes to take effect. You can test your set-up by opening a web browser and going to your domain name. If all is well, you should see your site appear in your browser. Once everything's working, you might want to make it easier for people to find it. You can start by setting up an account in Google Webmaster tools and submitting a sitemap. You could also register your site on pirepository.com, a site that lists web sites that run on Raspberry Pi servers. Sometimes it's useful to automatically run a script on a Pi when it boots up. You might want to start a script that monitors sensors, a Bittorrent client, or a program to back up your Pi to the internet. There are several ways of doing this, and each one has it's benefits. In the following examples I'm going to start a program called servod which manages a servo. The program runs in the background and uses the Pi's GPIO pins to set the position of a servo. The simplest method is to put a command in /etc/rc.local. This file is executed while Linux is booting up and before any users have logged in. When rc.local executes, the path environmanet variable (or any other environment variable) may not have been set up so it's important to use the program or script's full path. It's also important to make sure the program doesn't prompt for user input, as users won't have logged in when rc.local runs. If the program waits for user input, it won't complete, and the boot process will grind to a halt before users can login. Similar problems can occur with programs that aren't meant to complete like servod, which runs continuously as a service or daemon. The solution in this instance is to run servod in the background using the '&' symbol. This tells the bash shell to execute the program without waiting for it to complete. To save changes to the file, press control-o. You will be prompted to save to a temporary file name. Press return, and the crontab program will install the temporary file in the correct place. It's best practice to use a program or script's full path in crontab files. This command executes a script in /etc/init.d/ which can start, stop or restart the Apache web server. You can create your own init.d script for programs that you want to run at boot time. It should be put in /etc/init.d. It must start with a shebang (#!/bin/bash) followed by a LSB header, a set of specially formatted comments that contain information about the service. An example of the header can be found in /etc/init.d/skeleton. The code that follows the LSB is usually a bash case statment for processing the start/stop command line option. The option is stored in $1, and the case statement tests to see if the option is start or stop. If no option (or the wrong option) was supplied the default case executes, and a usage message is printed. If the start option is used, the script runs servod, and if the option is stop, the script kills the servod process. Sometimes when a computer is shutdown, services need to be stopped in a controlled way. Programs may need to finish logging data or release lock files before they are terminated. If a script is started using cron or rc.local, it will simply stop when the Pi is shutdown. Using the init.d method to control scripts means that when your Pi shuts down, Linux will gracefully shutdown the script so that it has a chance to finish off any final tasks. This creates a link to /etc/init.d/servod in directories from /etc/rc0.d through to /etc/rc6.d. When Linux boots up or shuts down, it looks in these folders to see if any scripts or programs need to be run. When I restart my Pi the servod program starts automatically.